This may be the best yurt installation you will ever have the opportunity to visit. Situated on an elevated platform this yurt features a covered wrap around lanai with views of tropical rain forest. If you seek a lifestyle experience where the ambience and charm captivate you this is your chance. Conveniently located only 45 minutes from Hilo, hot springs, tidal pools and even closer to Volcano National Park "Jeflani Hawaiian Retreat" offers privacy, a true Hawaiian countryside experience and an atmosphere that will urge you not to rush away to the next attraction but to stay awhile and relax. Wander the property and pick and sample fresh fruit of many varieties. Among the you may find more than 30 tropical fruits including avocado, star fruit, pickle fruit, banana, breadfruit, coconut, jack fruit, macadamia, soursop, apricot, malibar chestnut and more. The three acres is well maintained and relatively flat, walking around will normally result in a new discovery each time. Jim and Mercy are pleased to offer you the opportunity to share their Hawaiian dream. You can do the usual and rent a water front condo (and there is nothing wrong with that), or you may chose to experience the Big Island in an entirely different manner. Become part of the landscape and lifestyle. This is a destination; upon arrival you may very well realize immediate relaxation. The equal of a Colorado mountain cabin only in the tropical climate of Hawaii. Wander around the 3 acres and marvel at the lush vegetation and abundant fruit. Morning breakfast is best enjoyed on the spacious lanai - you chose the spot you most prefer, Mercy and Jim cannot agree upon one. You have a full bath with vanity and tub AND access to the downstairs outside shower. A 45 minute drive will get you to tidal pools, a warm spring fed pool, or the parks of Hilo. There is a drip coffee maker and a french press available. While some foodstuffs may be in pantry guests should anticipate providing for all their food and food related needs. The kitchen includes a gas range and microwave. Pots, pans dishes and cutlery are also available. The table has 3 stools, but 2 additional stools from the lanai are available. There are books available for guests, feel free to take a novel and leave a novel. The "lawn" is a lush 3 acre lot with fruit tress aplenty. Learn about some new exotic fruits and how to enjoy them! The unit has a full wraparound lanai. Away from it all, yet close to all. 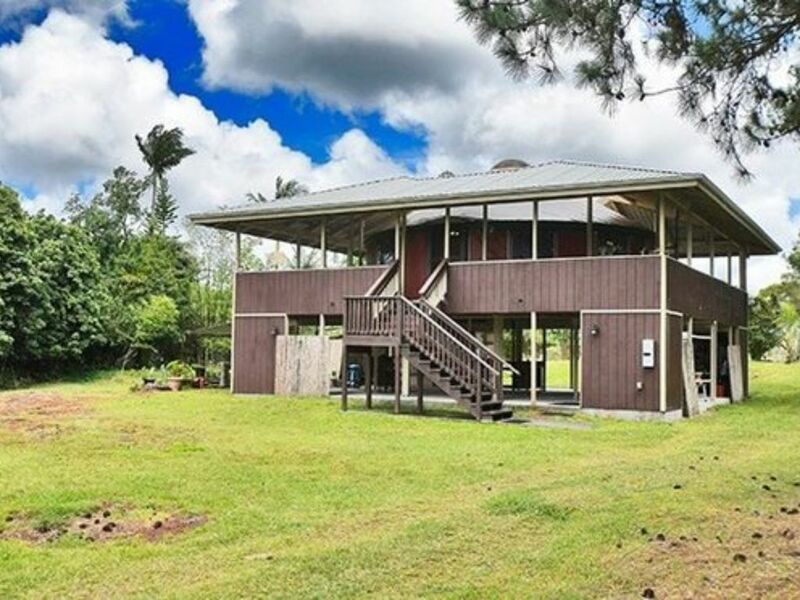 Enjoy the privacy and solitude of a remote location and yet be only 45 minutes from Hilo, tidal pools and a hot spring. It is only 30 minutes to Volcano National Park or historic and funky Pahoa. The yurt is roomy and very nicely furnished. Each piece of furniture adds to the ambience and there is not a piece too much. The garden is huge and well looked after. There are no neighbors to see and hardly any cars drive by on the road which anyway is a good distance across the garden from the yurt. The owners Jim and Mercy are very nice and considerate of ones wishes. This is a special Puna property. So glad you enjoyed your visit. The rural nature of the property has been a big draw. Thanks for the kind review and we hope you will stay with us again. I must first say that my wife and I very much enjoyed our time here! The land was beautiful and hearing the tropical sounds was awesome. We loved hanging out on the lanai and watching the animals around move about and the sound of rain on canvas was soothing. The yurt had everything we needed and then some. The experience was exactly what we were looking for, a new adventure that was outside the box and extremely comfortable with the given amenities. You really are out in the "country" so to speak and the terrain is tough so a larger vehicle is a must. There were just a couple of reasons we could not give this 5 stars, but both we feel can possibly be rectified. The entrance gate to the property utilized a very rusty and old chain with several locks on them. Because of the rain each time we needed to leave and return my hands would be full of rust and dirt. The one we were given a code for did not actually work and the inability to do lock it made the property feel less secure at night. This segways into our 2nd concern, as it plays into having a less secure feeling; security was important in the pitch black night because the lone neighbor we could see was very creepy. His property contains no lights whatsoever so at night you can hear him moving about but he is doing so mostly in the darkness. A couple of the nights he was playing very weird, classical music in the pitch blackness into the midnight hours. What added to the weirdness factor is that his dog would howl literally all day and night, regardless of whether or not he was home. This was a daily and nightly occurrence. So, at night, with the only neighbor you know is near you in the middle of "nowhere" down a road that is very much difficult to navigate as it is basically off road, not simply unpaved, and in the pitch blackness you hear a large dog howling, not barking, with creepy classical music coming from the darkness and you can hear this mystery stranger moving about with no lights, security and a locked gate helps ease the mind and imagination! We do understand that the neighbor and circumstances with him may not be at all something the owners can really do much about! However, it was difficult to put my wife's mind at ease some nights and did play a factor in our comfort level. But over all, those things aside, we loved it. I would definitely want to stay here again for a night or 2 if we ever have the privilege of returning to the Big Island! Thank you Jim! Glad you enjoyed it, sorry any experience created less pleasure. In the years we have lived here and rented to guests this is our first complaint about a neighbor we have only known as quiet, respectful and whose dog only barks when comes home from work. We were baffled to say the least when we read your comments. We contacted our neighbor and learned he had received a traumatizing diagnosis for advanced cancer and "may have freaked out a few days". He has now obtained required medical attention, and is sorry, as are we, for any discomfort this may have caused. Staying in a yurt is a unique experience. I felt dry and secure, yet closely connected to nature. This cozy home is well maintained, with everything you need for a comfortable stay. It is privately located in the center of 3 acres of a nicely landscaped rural property. The covered lanai completely surrounds the yurt and is a wonderful space to read, rest and relax. Although the final mile of unpaved road requires driving slowly. I managed it daily in a compact rental, with no problem. Also there is no cable, but was able to stream programming from my computer, and there is a DVD player for your favorite movie. The bathroom had a great shower/whirlpool tub. A truly great value compared to other options. It is conveniently located between Keaau/Pahoa and Volcano Nat'l Park, and I would enthusiastically stay there again. A very fun experience. Thanks for those positive thoughts! And, we would certainly welcome you back as a guest as you showed a true appreciation and respect for the property. The wrap-around lanai, the 3 acres of property and privacy have been the features that all guests seem to love. Great property, a bit out of the way, but comfortable with everything you need! We had a great and comfortable time staying in Hawaiian Acres! The drive, as warned and mentioned, was a bit rough but the seclusion we got was great. At booking we were not aware that the owners were going to be staying at the house in the basement area, which worked fine but it would have been nice to know when booking. Everything else was great! Glad you enjoyed your stay. Based on comments we are always working to make guest visits better. The listing indicate the owner is sometimes in residence, we will make that a more prominent notice. Thanks for staying. It was a great way to experience Hawaii. The yurt provided a new experience.for Hawaii different from the usual touristy vacation. It is in the countryside and the surrounding area is beautiful. It is comfortable and fully equipped. This is my third visit to the Big Island. The last mile to the destination has standing water on the road in some places but it's only four inches deep. We did it with a small car. It is always a delight to have guests who appreciate the rural nature of Jeflani Hawaiian Retreat and enjoy the tranquility it affords. 10 out of 10 would go back again!!! Great remote location with a beautiful landscape in a largely tropical area. Hosts even provided earplugs if the outdoor noises (Coqui frogs) are a bit much for you. It is remote so if you are renting a car be sure to rent an SUV, truck or jeep especially if it’s the rainy season. Glad to have you visit. The Hawaiian country sounds are a lullaby to some. Visit again when you can.